This is the perfect accompaniment to a bowl of roasted vegetables, or a large salad filled with a myriad of colors to fill you up for a hearty lunch or healthy dinner. This is great for week one of the cleanse, and a good meal if you are looking to reduce serving size or calorie intake. I eat 1/2 cup of rice with several nori, and tons of vegetables to fill me up. The best part, this is good food! I love to share these recipes that I cooked and learned about in culinary school. I have a mountain of recipes that I loved cooking and find that I need to share more with you. This was such a simple detail that I learned about, no big wow or deal here, super simple. 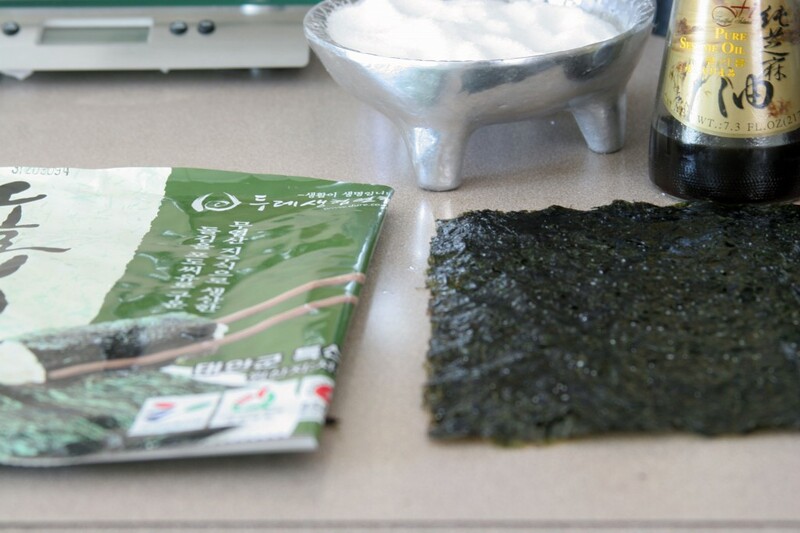 Nori sheets, which are seaweed sheets. Although I have eaten thousands of nori sheets in sushi, I had never eaten them this way. Each class for the Asian course, we would cook through different countries. This was week one, China. We made all of our dishes each day, and had a family meal to share our food with each other at the end of class, I loved this. Our instructor, who happens to be amazing, would make us a traditional beverage, and rice. We critiqued the recipes, and learned about where they came from, and how we liked cooking them. 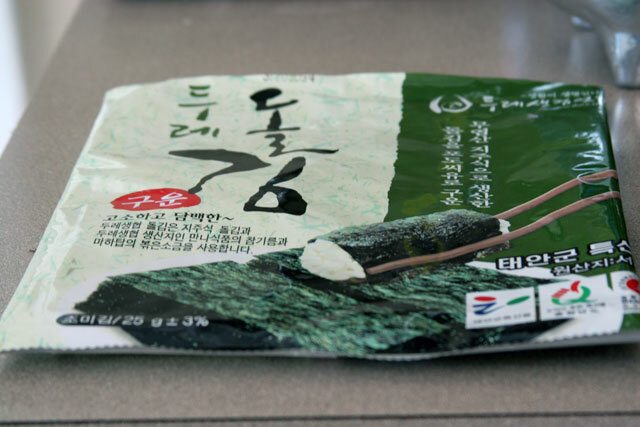 I saw Chef Wyncoop take a piece of nori and scoop some rice with it, I was hooked. Time and time again I find that I love simple foods from all over the world. 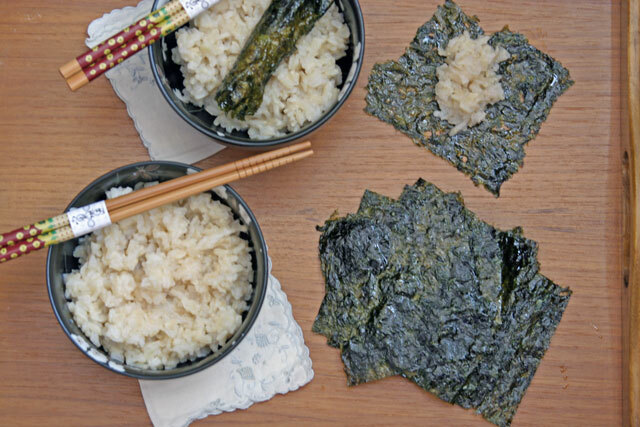 I enjoy a complex dish as well, but most often, it is the basic and beautiful swoop of a nori sheet to pick up rice simplicity that gets me the most. This is so easy and healthy. 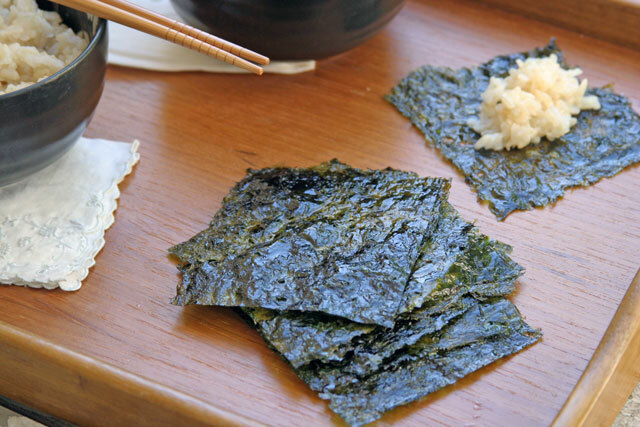 Nori is a flat sheet full of nutrition like protein, fiber, vitamin c, k, taurine, and b12. Cooking it lightly in sesame oil ups the nutrition, as sesame oil is full of health benefits as well. Couple that with a whole grain rice, and it’s a simple, filling, inexpensive way to a weeknight meal, meatless Monday, or a perfect small snack. 1. Rinse the rice in a strainer under running water until almost clear. Place the 2 cups of water in a 2 quart pot, bring to a boil, add the rice, and 1/2 teaspoon salt, cover. Reduce the heat to medium and cook for 40-45 minutes. 2. While the rice is cooking, prep the nori. In a large saute pan, add the sesame oil over medium heat. When the oil shimmers, add a sheet of nori whole. Sprinkle a touch of salt. Cook for 1-2 minutes, turn, and cook for 1-2 minutes. Remove and cut into squares. 3. 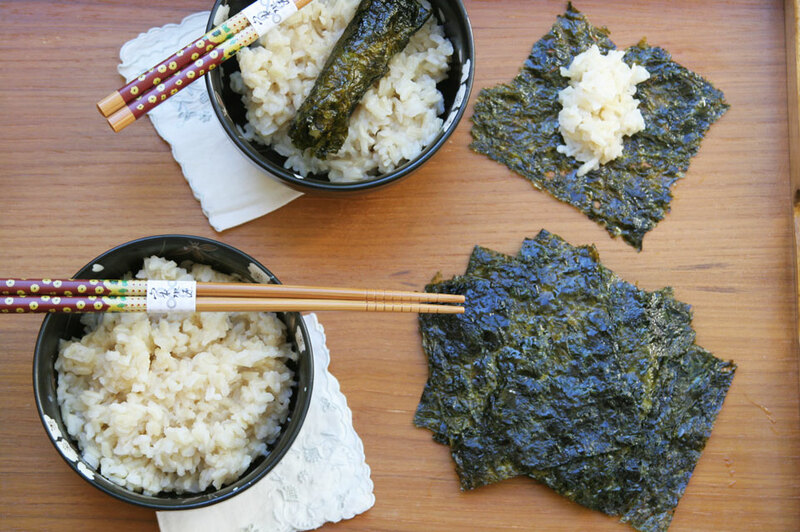 Serve the nori and rice with a variety of Asian dishes, or just as is for a nutritious meal.